RIO DE JANEIRO: After jetting into Brazil to watch the World Cup opening match, Leonardo DiCaprio decided to hit the beach, pointing his luxury yacht toward the famous turquoise waters off Buzios. DiCaprio, 39, has been spotted shopping, strolling on the beach and soaking up the sun around the resort town made famous by French actress Brigitte Bardot when she vacationed there in the 1960s. The "Wolf of Wall Street" star traveled to Brazil on a private jet Wednesday with 21 friends and is staying on a 482-foot (147-meter) yacht that belongs to Sheikh Mansour bin Zayed Al Nahyan of Abu Dhabi, the owner of the Manchester City football club. The yacht, the Topaz, is the fifth-largest in the world and sports three pools, a gym, a jacuzzi, two helipads and a movie theater. Its value is estimated at $400 million. 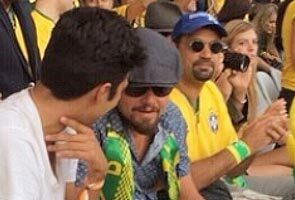 They sailed to Sao Paulo for Thursday's opening match between Brazil and Croatia, where DiCaprio sported a scarf with the Brazilian flag. After Brazil's 3-1 victory, the group headed back north to Buzios, a picturesque town in Rio de Janeiro state. Wearing sunglasses, shorts, sneakers and a baseball cap, DiCaprio spent Friday strolling around downtown. Accompanied by two young women, he walked along the beachfront, stopping in at sporty Brazilian luxury brand Osklen's local shop and buying a nylon jacket.